Hides the fairest in the land. Lead them to the golden prize. Cobra's Keep a dark surprise. Klaw, in a fit of rage at losing the guardian Kika, rushes with snake-like speed towards Richard and grabs him by the throat. The skeleton man lifts the Richard and peers into his eyes, noticing the different colored pupils. Klaw drops Richard and realizes one of his captives is the Chosen One. 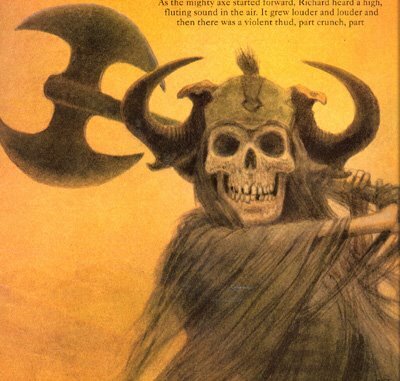 Glad that not all had been lost with the Guardian's escape, Klaw grabs a giant double-headed battle axe from one of his bone warrior minions and swings it in preparation of finishing Richard and his friends for good. 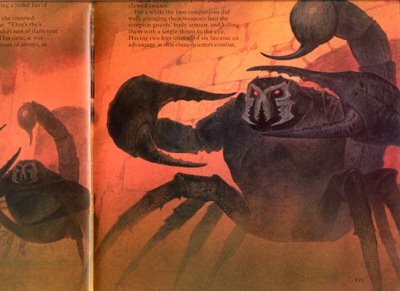 Before Klaw can deliver the final blow, Richard hears a high fluttering sound in the air that grows louder until it crescendos with a "violent thud, part crunch, part squelch, as if someone had trodden on an enormous beetle." Klaw instantly appears shocked and drops his axe before he collapses into the sand, a feathered arrow protruding from his bony chest and piercing his rotting mass of a heart. The trio breathe a sigh of relief at Klaw's sudden and unexpected demise, a feeling further heightened as Klaw's bonemen army disintegrates into lifeless heaps with their leader dead. After the bone army collapses, Kika appears from the sky and lands among the heap of remains. She hands a bewildered Orkan his bow, thanking him for its help. Richard tells her that he thought she had abandoned them to Klaw; Kika replies she needed to head to the mountains to find a rare berry whose poison could kill Klaw, a poison she had smeared on the arrow that had pierced the Evil One's servant's heart. She had hurried back as fast as he could, not even taking time to tend her leg. With this said, she produces a handufl of berries and herbs from her person and smears them into a poultice, which she applies to her leg wound. Instantly the wound feels better. Remarking that she needs to do one more thing, she hurries to Klaw's corpse and searches for the weapons he had taken from her. Eventually she finds them: a "finely wrought blowpipe and a bundle of needle-sharp darts." With Kika's possessions recovered, the group begin their trek across the desert to find Sand City, where the next Life Force Pod lies. As they cross the vast expanse of sand, Richard notices how cold the desert becomes as the light begins to fade. Kika sniffs the air and recognizes the odor as a coming storm. She warns her friends, but her warning does little to help them when the rising winds become a fierce shriek that sends showers of sand their way. Forced to hold hands in order not to lose each other, the group forces their way through the sandstorm that threatens to rip their eyes from their sockets. Thankfully, however, the storm attacks them in lulls, giving them some moments of peace. Then, without warning, as the group reaches the top of one of the sloping landscape's hills, the storm dies down and the scenery of distant ridges ahead of them changes into a city surrounded by a high wall. 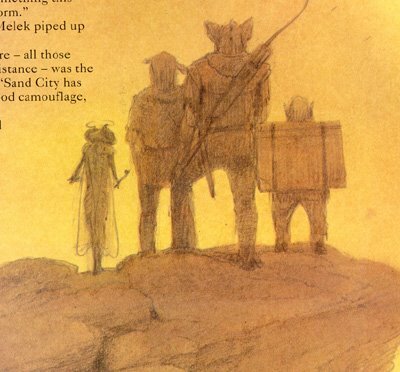 Kika identifies the metropolis as Sand City, a city that used a mirage of distant ridges as camoflage. Grateful for Kika's guidance, Richard leads his friends towards the city. To their dismay, they find the outer wall is towering and windowless with a single entrance that is guarded. Six creatures stand at the gateway, all of them giant scorpions that do not look at all friendly. Kika tells her friends to wait hidden by the entrance while searches for an alternate way inside. The Guardian searches along the perimeter of the city as quietly and carefully as she can until she spots a promising locale: a section of the wall that had collapsed outward into a pile of rubble. She flies back and tells Richard, who promptly leads Orkan and Melek to a ridge close to the spot. With Kika making sure the coast inside the city is clear, Richard leaves the safety of the hiding spot and climbs the stone rubble first. At the top, he signals the coast is clear to his friends. Melek makes the journey across the sand and up the rubble next without trouble. 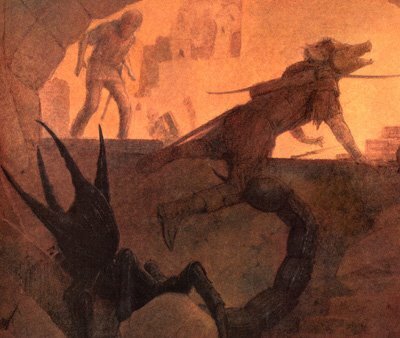 On Orkan's turn, as he races towards the rubble, a giant scorpion suddenly appears out of nowhere. Orkan sprints towards the rubble and scrambles up quickly, but the scorpion guard is faster. Before Orkan can get to safety, the scorpion stabs Orkan's thigh with its enormous stinger and pumps venom into the pigman. Orkan screeches in pain, but manages to unsheathe his sword and cut the scorpion's stinger from the creature's tail. 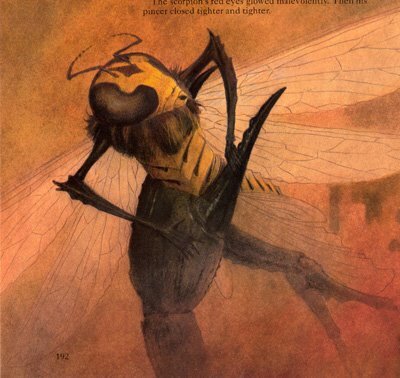 The warrior scrambles to safety before pulling the stinger from his thigh, tossing it aside. Richard and Melek rush to their friend and pull him up a set of steps that lead away from the scorpion's reach. By the time they reach the top, Orkan feels himself grow numb and drift into darkness. He hears the reassuring voice of Kika before he finally blacks out. Kika lands near Richard and orders him to lance the wound while she uses the remainder of her herbs and berries to treat the wound. Richard does what she asks, allowing some of the poison to drain from Orkan's leg. Kika applies the medicine to Orkan's wound and confidently says he'll be all right. Melek suggests that they read the Book of Prophecies and consult the Path Finder. 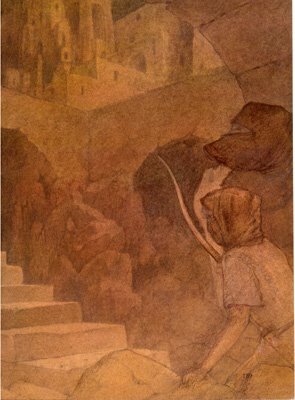 After reading the cryptic passage in the Book, Richard takes the Path Finder and turns it until its arrowhead glows gold pointing at a tall tower, most likely Cobra's Keep. Moments later, Orkan awakens, a little groggy but otherwise all right. With his friend okay, Richard begins to lead his friends toward the tower to get the pod. The storm had renewed its intensity, forcing the group to slow their progress through the city. Their progress through the eerily deserted metropolis is at a snail's pace, but thankfully they don't run into any scorpions in the city streets. Eventually, the group arrives at a wide thoroughfare, just as deserted as ever. But as they companions enter the thoroughfare, they hear a familiar "tik-tik-tiking" from all sides heading in their direction. The group make an attempt to run, but a pack of scorpions emerge from all sides, surrounding the group and cutting off any escape. Before Richard, Orkan, and Melek could make a move, Kika whips out her blowpipe and sends a stream of darts towards the scorpions. She tells her friends to aim for the eyes, the scorpions' weakspot. She sends another volley of darts in the scorpions' direction, this time aided by Orkan as he fires a steady stream of arrows at lightning speed. But the scorpions are too numerous and close in too quickly, making Kika's darts too risky. Orkan manages to empty his quiver before the scorpions close in, and he starts to face the creatures in close combat with his sword. Richard joins in, slashing at the monsters' eyes with Juroot's dagger. The close-quarters combat proves to be an advantage for Richard and Orkan, as the scorpions move too clumsily to find an opening. Melek manages to dodge the scorpions' stingers while Kika helps whenever she can with her blowdarts. But then, just as Richard and Orkan slash their way through the blue-black ranks of the creatures, a scream for Kika is heard. The trio turn to see the Guardian has been captured by one of the scorpion's claws. Kika cries out for help as the scorpion malevolently tightens the grip on his pincers. The Scorpions are exactly what their name suggests: regular scorpions, only far larger, more intelligent, and deadlier. 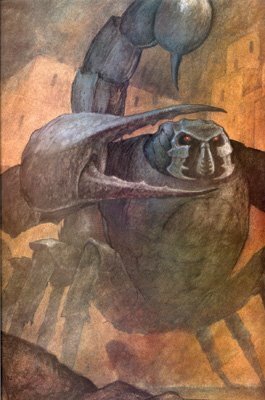 With the insect-like menace of Baal and the soldier-esque menace of Cozards, the Scorpions guard the metropolis of Sand City from intruders, using their powerful claws and vicious stingers as weapons. They have no designated leader, which makes them difficult to demoralize in the midst of battle. "Richard peered at the creatures. They were like the scorpions he had seen in books, but larger, much larger. Their narrow, blue-black bodies curved back to fiercely barbed tail. Only their eyes were different, glowing a deep, murderous red inside shrouded sockets. Suddenly, the guards changed formation, moving aross the sand in a complicated manoeuvre. From where he stood, RIchard could hear the skittering tik-tik-tik of their claws on the ground. It was a cold, precise sound that struck a chill deep in his heart." 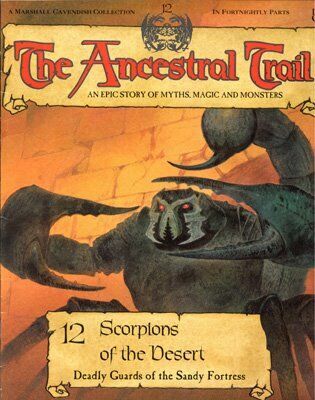 If a giant spider and killer bees aren't enough insect enemies in the Ancestral World, the twelfth issue of The Ancestral Trail introduces giant scorpions to give folks with entomophobia more willie-nillies (and they will not be the last insect(s) to give the Chosen One a fit, believe me). Of course, what makes scorpions deadly are their poisonous stingers, but curiously these giant anthropods do not pose that as much of a threat as their appearance would indicate. Yes, one managed to pierce Orkan's thigh, and by the end of the issue Kika is in the grasp of one of the beasts, but Richard and his friends managed to hold their own against them for a while thanks to the beasts' clunky movements. Naturally, if the insects were as smart as, say, Baal, then Richard and friends would be screwed, wouldn't you say? "So, it is the Chosen One! Maybe the day hasn't been wasted ater all." Richard: "I thought you'd run off and left us." Kika: "I had to get to the mountains to find the potion I needed. There is a rare bush whose berries contain the only poison capable of killing Klaw. I smeared some over Orkan's arrow and came back as quickly as I could. I didn't even stop to tend my leg, but I did get what I needed for it." "This is going to be worse than I thought. Keep your faces down and your mouths shut. Whatever you do, don't look straight into the wind. This stuff can scour your eyeballs in seconds." Richard: "How come we didn't see the city before? Surely we'd have seen something this big, even with the sand storm." 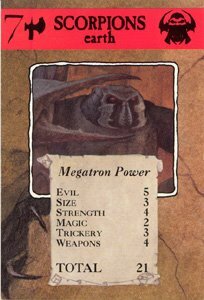 Melek: "Maybe it's a mirage." Kika: "No, what you saw before - all those ridges going off into the distance - was the mirage. Sand City has been here all the time. Good camouflage, isn't it?" "Aim for the eyes! That's their vulnerable spot."